Last week's challenge slideshow is late, my apologies. Oh dearie, I hope to have it up and running soon!! Okay! Welcome back to this week's challenge. All is well on the home front at Casa Diva. 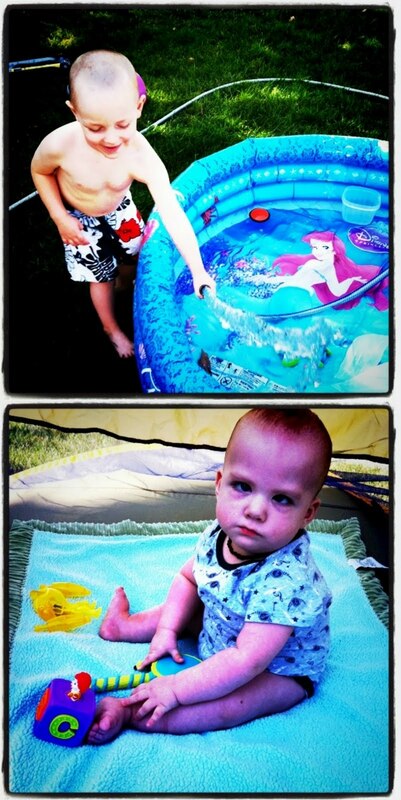 It's been super hot the past few days so we've been playing outside, making the best of the weather. The creeper on my back deck is all changing colour (red, green, orange and gold) - and the nights are cool... it's beginning to smell like fall... and i love fall. it's my favourite season, sadly its very short in The Skatch. My husband told me the other day that they're predicting the big S word (SNOW!) in October! sigh. oh well. So, before we get going on this week's challenge - i have some exciting news! The challenge has a sponsor! WOOT WOOT!! what does that mean? well, it means PRIZES for you!! i was contacted a while ago by the wonderful folks at CropStop! 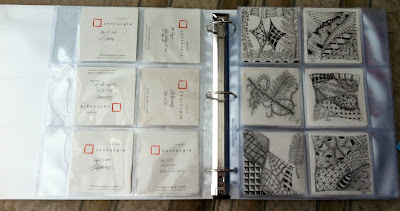 who sent me some their Zentangle Pocketz Pages to check out, and they're pretty great! 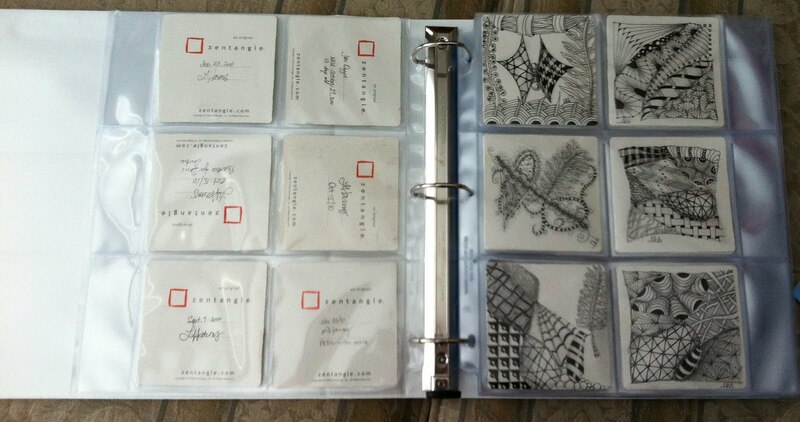 Each page holds 6 3.5 x 3.5 inch square Zentangle tiles!! This weekend marked the Ten Year anniversary of the tragedy of 9/11 in New York City. Now, as you may know, i'm Canadian - but i don't think there was a soul on the planet who was not moved and struck by the act of sheer hatred that rocked us all. I remember where i was when i heard - i was home sick, and my mom called me from the University and said; "Laura, turn on the news. Something terrible happened." I watched them play and replay the footage of the first plane hitting the tower, and then someone screamed: "There's another plane!" I couldn't believe it. I still can hardly believe it. Such devastation and loss and destruction, and for what? Hate. But you can't fight hate with hate. It must be with love. And in the darkness of all that hatred, we did find love. We saw it in the brave and heroic men and women who first responded to the scene, we saw it in those who reached out, those who held perfect strangers hands, we saw it in the act of rebuilding.... Love is the ultimate force in the Universe. Love heals, love gives us hope, love endures...Love conquers all. So, this week the challenge is Love. Whatever it sparks in you, however you want to interpret it. As long as you do so with the spirit of love, because through love we have the ability to change the world. I haven't entered yet, but wanted to tell you how much I LOVE your tile. It looks SO 3-dimensional. Great job. I'm number one ;-) When I think of Love, I think of family. I've entered a ZIA of my daughter's name. This will be a very creative challenge and it's a great one! Thanks, Laura. Lovely post, Laura. Your message brought a tear... and a prayer that love will indeed be the catalyst to change the world. Lovely post and fitting theme. I lived in NY when 911 happened. It was so awful. I almost can't bare to think about it. Your post gave me goose bumps. May we never forget. This challenge took me to a place I didn't expect, but thank you for making me remember. #9. Thanks Laura, your beautiful tile shows spirit and the love of creating. A very appropriate challenge. I'm excited to see how people interpret this one! Your tile is astonishing by the way! Oops! I forgot to mention that I'm #12! Love those Pocketz Pages! I'm #14 and had some fun with this theme. Since I'm new to tangling, I'm going back and working through each of the earlier challenges in addition to the current week - some are more successful than others, but I'm loving the process! Hi Laura, I'm #15. Thanks so much for giving me the opportunity to honor the outstandingly loving people in my life with a tangle. This has been such a wonderful challenge. Number 19 here. Thanks, Laura, for your very thought-provoking post and an opportunity to try something new--expressing a concept with a zentangle. Thank you, Laura, for the timeless reminder and another wonderful opportunity to act on it. Dilip and I really scratched our brains to try and come up with something which expresses deep love. Thanks for a great way to look at such a horrible day. I'm number 23! Hope the snow stays away a little longer. A little slow, but rolling in at #25. What a perfect challenge for this week. Hi Laura, I loved your post and your tile! After seeing all the news on the 10th anniversary of 9/11, I was so glad to focus on love. I am #27. Love and hugs to you! Hi Laura, This was quite an emotional tangle for me in a very personal experience. Thank you for the challenge. I am #28 on your list. We all need a little love. I am #34 on the linkey machine. Thanks for this great challenge. Thanks for the challenge. I'm #37. Thank you Laura for this fantastic challenge. With your Challenges you manage to bring people together from all over the world. This was fun, i posted my hubbie valentines card form my blog thingie. This was harder than I thought it would be. I'm glad to have these challenges to push me. Thanks Laura!! Such great art!!! I started Zentangles in May 2011 and have the addiction already! I love your spin on it. #47. Thank you for the challenge - a wonderful theme. I left a comment and didn't do the word verification!! My bad! Thank you Laura for hosting this awesome blog! You are awesome and I love making the tangles so! !Don't we all get addicted? I know I am!! In at #52 - very interesting challenge to interpret - very surprised at the process that evolved for me on this one. Always fun and glad for the chance to explore more with zentangle - thanks. I get so busy drawing, that I forget to post my tangles. I feel like I'm learning so much from visiting all the great blogs! Thanks! 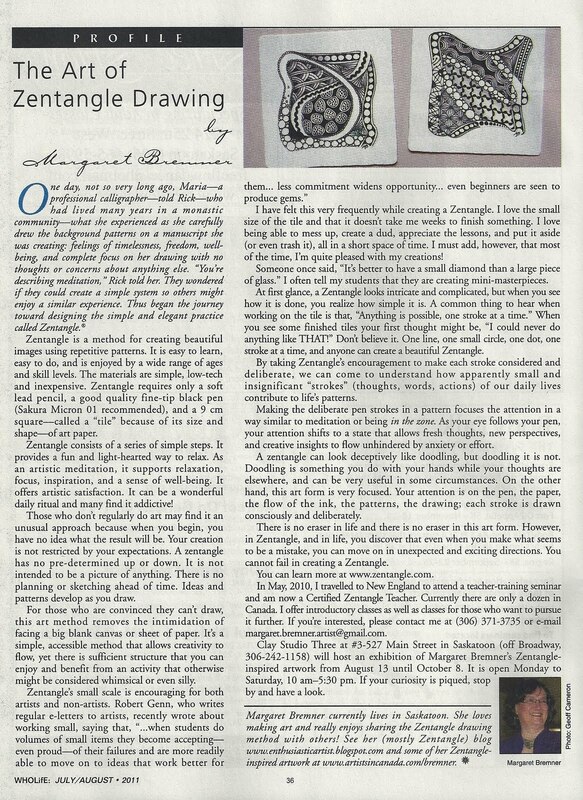 It's so amazing that you gave us this opportunity to put some Zentangle love into such a good purpose. It's been hard to look back on 9/11, and remembering the power of love puts a whole new perspective on it. The stories that are newly emerging of love, courage, and compassion have made this anniversary so very moving. I thought about this every day all week, and finally at the last minute, was able to final put my vision into a fast rendition. I am #57. I'm #59 (wishing that I was prompt enough to be in the top 20, but life just doesn't allow that) and just want to thank you again for these challenges. They are a great excuse to get my tangle practice in.... and are wonderful to stretch my mind! I have the pocket pages already and they are a wonderful way to keep and display my tiles. I'm in at #58. Thank you. Laura, for a very thoughtfull and thought provoking challenge. Hope all is well with your family! Great Challenge! Thank you! I am #61. Late to the party again. Love what everyone has done with the challenge.